Facebook friend Mel Lucas reports that she "just found out that a friend got stabbed after his bicycle ride this morning in Jacksonville by an angry motorist. I'm so disturbed by this news! What has this world come to? And more importantly, I'm wondering...do we need to start carrying weapons during our rides?" "2 riders were stabbed on the Kent Campus ride by a motorist who followed us into kent campus and stoppe, got out and picked a fight. 2 hospitalized one with life threatening injuries. KAtei and I tied tournaquets and did what we could. John Faulk was stabbed 6 times. They caught the guys and he's being charged with 2 counts of aggrevated assault. :( Not a good day. Sorry to bug you on vacation." Here's the Jacksonville newspaper story on the motorist stabbing the bicyclist. A man driving a pickup truck brushed up against one of the cyclists and another rider started yelling at the driver. The driver followed the group into the parking lot, got out of his truck and moved toward one of the cyclists. When the driver, whom Hurst said was in his late teens or early 20s, bumped his chest against the cyclist, another rider punched the driver in the face. The driver then stabbed the cyclist who punched, and slashed another rider who tried to break it up. Florida Bicycle Volunteer of the Year, Jim Shirk of Tampa, sends me a lovely little youtube nugget showing LA cops taking down bicyclists in a critical mass/BP protesr ride. As many of you know, Washington, DC is opening a bike lane down Pennsylvania Avenue and that means taking a lane of traffic from cars in both directions. Here's the latest about the struggle for bicycles and cars to play nice. The Waashington Post has cranked out a series of cool bike stories recently, including this one about a bike rental program at a law firm. It was a pleasure to alter the Flatwoods Park Ride, adding eight miles or so to my usual base, so that I could ride early this morning with my SHBC pals Jack "Ghost Rider" Sweeney and Doug "Philisophy Prof" Jesseph. Here's Jack and Doug taking Harney Road toward Temple Terrace. We rode about 49 miles and moved at a pretty nice clip. The Ghost Rider's Coney Island Lager jersey offers a smiling face that is a very appropriate part of the Ghost Rider's bike jersey collection. When the city of Tampa decides to build a road the correct way, it's capable of doing the job. Witness the 40th Street Bridge in east Tampa, where a concrete barrier divides pedestrians from the roadway. There is a comfortable road shoulder to accommodate bicyclists and even a turn lane. The light is incredible at Flatwoods park early in the mornings on early-am bike rides. Bicycle Stories thanks Joe Hayes Howard for this youtube video of Saturday's Hub Grub Bicycle Ride 2. I was informed of an unfortunate incident in the San Antonio area. Robbin Lorenz, who cycles in the San Ann area, reports that, "Yesterday I was in San Ann on a training ride and some guy decided to use me as target practice by throwing a plastic koozie at me and smacking me in the back. The truck was so close to me that I thought that his side view mirror had hit me. As the truck drove down the road the guy in the passenger seat had his head out the window laughing and checking out his throwing skills. It all happened so fast and I was so surprised that I wasn't able to get a tag number." Robbin contacted Laura Hallam, executive director of the Florida Bicycle Association, who shared it with George Martin, the FBA's bike laws director who visited Tampa several months ago to talk with Tampa Police. George is developing bike laws modules to teach law enforcement agencies about bicycle laws. George says, "Of course the police won't be able to respond without a tag number, but it should be reported anyway. Description of vehicle, location, etc. It is probably happening to others as well. Get it on the record. The police, the county commission, the MPO, all other senior officials in the county and municipality, if you were in a city. If all of these are reported, a pattern will emerge which the officials cannot ignore. They need to know when these things happen . . . That is battery, a felony." "I just got off the phone with the Pasco County Sheriff department. They will not take a statement over the phone and want me to come to the office there in Pasco to report the issue. I feel that it is important enough so I have an appointment to go and give a statement tomorrow morning. "Thanks everyone for all your help. I will keep you posted. Not sure what if anything can be done at this point but like most of you pointed out at least it will be on record." I'm urging the sheriff's office in Pasco County to take the harassment of bicyclists seriously and treat it with as much as a priority as they have with monitoring the conduct of bicyclists on the roads outside San Ann. Kudos to Bridget for creating this entertaining video of Saturday's Hub Grub Bicycle Ride 2. It was an amazing day. When I was at the front of the ride, I would occasionally turn around to see the bicyclists behind me and I could not see the end of the group. The line of 120 bicyclists pedaling from restaurant to restaurant through Seminole Heights Saturday afternoon stretched amazingly far. Shouts out to Jose for his sweeping duties, Yvon and Mike for touching base with the restaurants, Rick and Lisa for video, photo and Web work, Margaret for signing up with people and Doreen for prepping the updated Hub Grub flier. What an amazing afternoon of bicycling in Seminole Heights Saturday afternoon. The Hub Grub Bike Ride had every type of bicyclist on the restaurant bike tour and we had cyclists of all ages -- from Police Chief Jane Castor's sons to 85-year-old Dot, who wore a silver helmet. 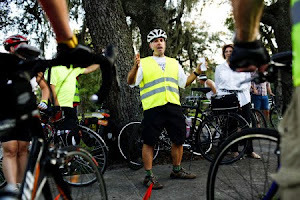 The Hub Grub Bicycle Ride bicyclist of the day goes to Ed Hillsman, who was wearing one of those bright green vests and gripping a sweep broom in the Fletcher Road bike lane early this morning while I was biking back to Seminole Heights from Flatwoods Park. You know how you admire people who actually do stuff that you only think about doing -- like in this case, sweeping crap out of a bike lane or shoulder like Ed was doing this morning. I make mental notes all the time to sweep bike lanes and also the crappy debris-filled evil triangles at intersections, but to this day I have failed to pick up my broom and clean the damn crap out of the road. But there was Ed, wielding the stick with bristles and helping bicyclists who use that bike lane. "That was me you saw on your bike ride this morning, as you were heading east through the Telecom Parkway lot (hat, dayglow-green vest, push broom). "I recognized you as you passed but you were out of earshot when I called back to you. I'm certain I gave the appearance of elderly crackpot. "Anyway, I was returning from sweeping sand piles out of the bike shoulder in front of the Carlton Arms Apartments. I'd reported the problem to the County Public Works Department a couple of weeks ago on their website (http://www.hillsboroughcounty.org/publicworks/about/contactus.cfm), but never received an acknowledgement or other reply. "This week, one of them shifted to fill the full width of the shoulder, and after losing control on it I decided to make it at least minimally passable again, and I while I was at it I cleared another area that was bad and becoming worse. "But they really do need to get out there with a scraper (followed by a sweeper) and reclaim the shoulders from the overgrowth, certainly before we take a bunch of students out there for the Bicycle Bash next fall, but preferably sooner. "I meant to take before and after photos but forgot my camera. "See you at Hub Grub this afternoon." Yes indeed, Ed, I will see you at the HG2. Some more fun bike links during this Bike to Work Day during National Bike Month. Randy Wynnne, WMNF's program manager, sends a fun NPR piece on customized commuter bikes. And my speedy bike friend and fellow Flatwoods rider K.C. sends alonga link with a bicycle brand name that I was not aware of. See you at the Seminole Heights Hub Grub Ride Saturday! 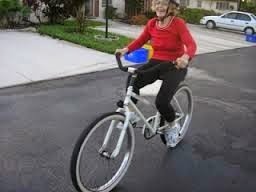 Update on Saturday's Hub Grub Bicycle Ride in Seminole Heights: I'm informed we'll have some special guest bicyclists. Tampa Police Chief Jane Castor and Tampa City Councilwoman Linda Saul-Sena said they plan to bike with the Seminole Heights Bicycle Club's Hub Grub Ride. We will gather at 2:45 PM in front of the Garden Center at 5800 Central Ave. Ride starts promptly at 3 PM. If you think the tensions and conflicts between bicyclists and car drivers in the hilly San Antonio area outside Tampa and the equally roller-coaster terrain of the Clermont area outside Orlando are isolated, think again. Across the country, conflicts are playing out in urban settings, suburbal sprawl and on rural roads. 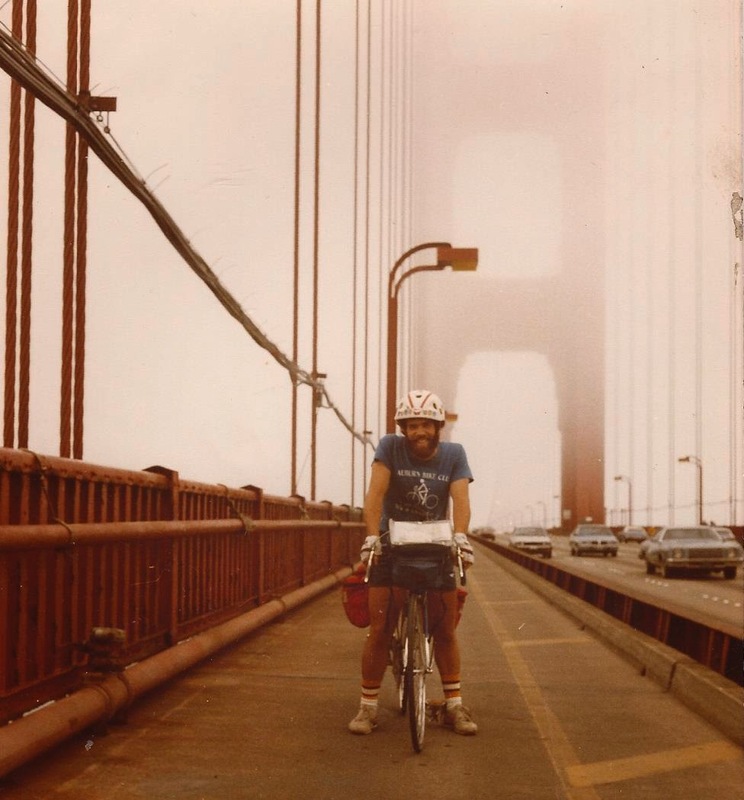 This being National Bike Month, newspapers and radio are taking at look at what happens when more bicyclists take to the road and more car drivers take to the road (some in vehicles the size of Rhode Island). It's a sometimes combustible and dangerous mix. 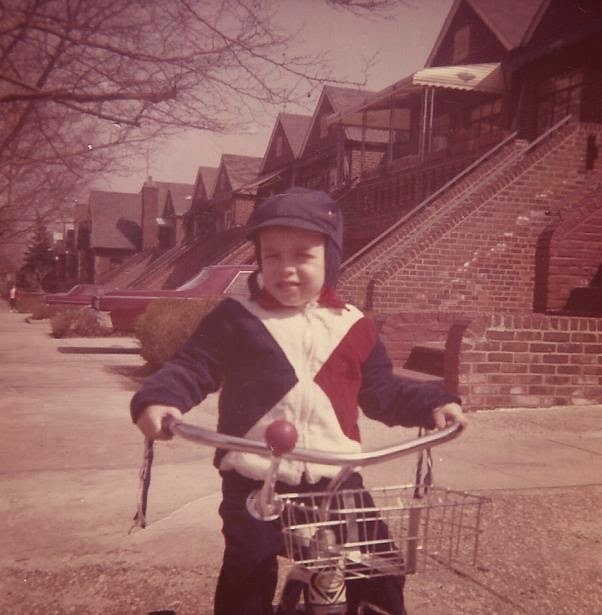 My bicycle pal Laura Sarantis of Rockville, MD sends a Washington Post story about the increased bicyclists on the roads and the conflicts that can arise with motorized vehicle drivers. Washington, D.C. bicyclists were upset recently when a local radio sports guy by the name of Tony Kornheiser criticized the city's decision to put bike lanes down the center of Pennsylvania Avenue and suggested hitting cyclists. Close to home here in Tampa, my bike friend Nico sends me an NPR piece that features a Q and A between NPR host Neil Conan and Bicycling Magazine Editor Loren Mooney about bicyclists and car drivers trying to co-exist. Mooney talks about bicycling in New York City and coping with everything from cabs to hot dog carts. As a former bike commuter in Manhattan, I was doored twice and received brused collarbones both times. Here's an interesting story about the first time I was doored in New York. It happened when a woman getting out of a cab swung her door right into me while I was biking in a bike lane next to her parked cab. I went sprawling to the pavement and the woman walked away without even checking on me. But several New Yorkers on the nearby sidewalk came to me aid, including one kind woman who took my wallet that had fallen from my pocket and placed it back in the pocket of my jacket. Speaking of bike lanes, the Florida Bicycle Association and other bicycle leaders in Florida are asking Gov. Crist to veto House Bill 971, which includes a part that would require bicyclists to use bike lanes in nearly every circumstance. 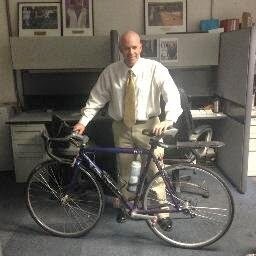 The Sarasota Herald Tribune ran a story about Sarasota resident and FBA lobbyist Mike Lasche mentioning that there are times when the best and safest thing to do is leave a bike lane. And some bike lanes are next to parallel parked cars, where drivers could suddenly open doors in front of cyclists, Lasche noted in the Herald Tribune story. I learned all about that while bicycling in New York City when I got doored. And lastly, Randy Wynne, program director of listener-supported WMNF radio, sent me this gem from the Onion magazine about bicycle helmets. Remember folks, The Onion is just goofing on ya. -- Program Award: Karen Kress of the Tampa Downtown Partnership and Julie Bond of the Center for Urban Transportation Research at USF were recognized for their bike program, Tampa BayCycle, which works to get people on bikes to work, school and play. -- Volunteer Award: Jim Shirk of Tampa is Mr. Bicycle Volunteer in the Tampa Bay area. 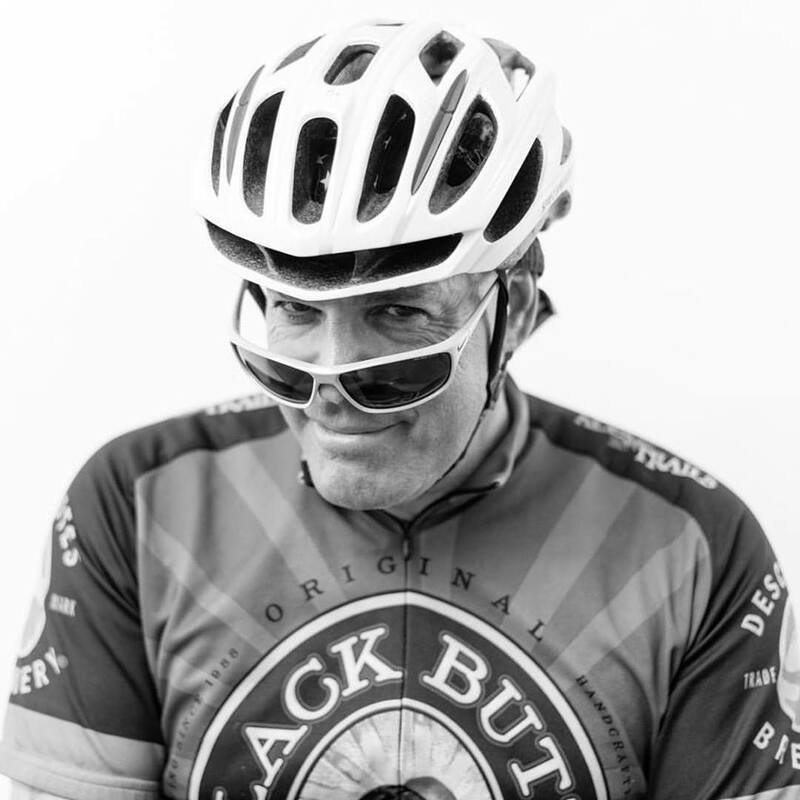 I can personally tell you that Jim works selflessly and tirelessly on so many bicycle events. He helped me put on the Bicycle Bash and created a bike route for the Seminole Heights Home Tour -- and that's a small slice of his volunteering. He also serves on the Hillsborough Bicycle-Pedestrian Advisory Committee. -- BPAC Award (speaking of BPACs): Congrats to the Pinellas County Bicycle Advisory Committee, led by chairman Tom Ferraro, who does a terrific job leading that panel. Kudos to support staffers Brian Smith and Sue Miller. -- Special Recognition of the Year Award: Rebecca Afonso, of Oldsmar, whose bicycle help included doing terrific work for the 2010 Florida Bike Summit in Tallahassee. Disgraced Floyd Landis, stripped of his 2006 Tour de France title for using performance-enhancing drugs, admits he used PEDs. Citing a Wall Street Journal report Thursday, the AP said Landis, "accused seven-time Tour de France champion Lance Armstrong of involvement in doping." The League of American Bicyclists comes out with annual state rankings for bicycle-friendliness every year. This year, Florida was 12th in the country, which is rather remarkable when you consider how many bicyclists are killed and injured by cars in the state and how many people complain that they don't feel safe biking on roads around the state. Also, right here in Tampa, we had a local DOT district office that failed to put bike lanes on recent resurfacing projects on Gandy and Busch. And we have a city mayor who just killed a city staff plan to stripe bike lanes on Euclid Avenue. The good news is that we have an active Florida Bicycle Association, which I'm proud to say I am a member of, that pushes pro-bicycle policies throughout the state and that has a voice that is getting louder each year. Florida's ranking has gone up and down the past few years, from 21st in 2008 to 32nd in 2009 and to 12th in 2010. Keep in mind this is the same League of American Bicyclists that gave the city of Tampa an "honorable mention" a few years ago even though the city has no bicycle plan or bicycle coordinator. Washington, Oregon, Minnesota and Wisconsin have been in the Top 5 each of the past three years. The rankings "are based on a 95-item questionnaire that evaluates a state's commitment to bicycling and covers six key areas: legislation, policies and programs, infrastructure, education and encouragement, evaluation and planning, and enforcement," according to the League of American Bicyclists. The League represents the interests of America's 57 million bicyclists, including its 300,000 members and affiliates. The Hub Grub Bicycle Ride, put on by the Seminole Heights Bicycle Club, is ready to roll on Saturday. South to Osborne, left to Nebraska. Stop at Reservations, southeast corner of Nebraska/Osborne. Cross Nebraska Ave., west on Osborne, right on Central Ave. Cross Hillsborough Avenue to Starbucks, northeast corner of Hillsborough/Central. Make right out of Starbucks parking lot on Central and go north on Central. Cross Hanna Avenue, left on Knollwood to Florida Avenue. Stop at Viitals bakery/Stephanno's Pizza at Florida/Knollwood. East on Knollwood, right on Central Ave., right on Hanna, stop at Smokin' A's BBQ at Hanna/Florida. West on Hanna, cross Florida Avenue., left on N. Tampa St; left on W. Idlewild, right into parking lot of Front Porch. Leave parking lot and make left on W. Idlewild, right on Tampa Street, right on Hanna and cross Florida Avenue to Central Avenue. Right on Central, cross Hillsborough Ave. and left on Osborne, then left on Nebraska Avenue. Go 1/4 mile north to Ella's. Walk or ride bike across Nebraska Ave., go south one block and turn right on Conover, left on Taliaferro, go south to Osborne, make right, and then right on Central Avenue. Go north to Frierson, make a left turn and follow to Florida Avenue to The Refinery, at Frierson/Florida. Walk or ride bicycle across Florida and go south two blocks to The Independent on Florida Avenue. To return to Garden Center, walk or ride bicycle across Florida, go north 1 block to East Wilder Avenue and turn right to Central Avenue. Turn left on Central Avenue and go north, cross Hillsborough Avenue and Garden Center is on left.